Improper use of the keyboard and mouse can cause ailments generally referred to as Repetitive Stress Injuries (RSI), repetitive motion injuries or repetitive strain injuries – involve wrists, arms, neck, back or shoulders. 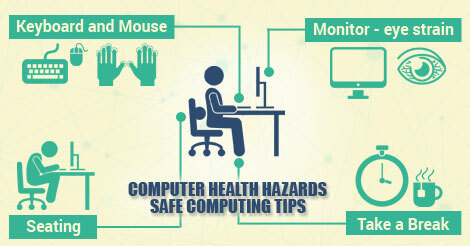 Symptoms of computer–related repetitive–motion injuries can be mild, such as stiffness and minor pain, sometimes your symptoms may not occur until several hours or even days after the activity which causes them. Proper typing is one of the best ways to prevent RSI. The most common mistakes people make is to contort their hands to perform key combinations, such as a shifted letter. Ctrl and Alt keys present the same problem. Typing key combinations by contorting one hand often leads to numbness, tingling, or loss of feeling in the little finger. Instead, you should use one hand to hit the letter key, and the index finger of the opposite hand to hit the Shift, Ctrl or Alt keys. Twisting your hands puts a strain on them. Resting on a wrist rest, the table, or arm rests while typing forces you to twist your hand to reach some keys. Instead, it is better to keep your hands moving freely above the keyboard, letting the strong muscles of your arms move your hands. Rest your wrists on a wrist rest only when you are NOT typing. Wrist rests are designed to support the heel of your hand, not for resting your wrists. Place wrist rests, so that the top is level with the top of your keyboard’s space bar. Make sure you sit centered over the part of the keyboard you use the most. Don’t sit centered over the number pad if you never use it. There are a number of “Ergonomic” keyboards including one from Microsoft Computers. Ergonomics is the study of the interaction between the computer user and his/her environment. While these keyboards can help reduce wrist or hand strain in some individuals, the key to healthy hands has more to do with how you work, and how often you take breaks rather than what type of keyboard you use. Stretching your arm to reach out to the mouse can cause mouse “Shoulder” and “Mouse arm”. The mouse should be placed near the keyboard so that it is easy to use without stretching the arm too far away from the body. Looking at the monitor for extended periods can cause eye strain. Eye strain means different things to different people. It may be experienced as burning, tightness, sharp pains, dull pains, watering, blurring, double vision, headaches, and other sensations, depending on the person. The major factors affecting the eye of a computer user are glare, luminance, distance between the eye and screen, the user’s vision and his/her corrective lenses. Keep the monitor as far away as you can to read comfortably. Conventional wisdom for monitor height is that the top of the screen should be at about eye level. This is fine for some people, but not quite appropriate for others. The current recommendation is that eye height is the highest a monitor should be at, not the best height. Many people find a low monitor more comfortable for the eyes as well as the neck. Proper lighting for your work area is important. While you want to be sure you can see your work, you also want to avoid looking directly at a light source or having glare reflected off your screen. Lighting should be indirect and even. Don’t aim a light at your reference documents, and be sure you’re not facing either a light or a window. If possible, place your monitor at a 90° angle to windows and other direct sources of light. A tiltable monitor stand will enable you to adjust to different lights. Keep your monitor screen clean, wipe it with a slightly wet lint free cloth every day before you start work. Set the brightness of your monitor at about the same level as that of objects in your field of vision, such as the wall in front of you. And keep reference documents at about the same distance away from you as the screen for comfortable viewing. The brightness and contrast control of the monitor should be set properly for comfortable viewing. Turn the brightness to minimum, then set the contrast to a level comfortable for your viewing. Natural mechanism of blinking gives our eyes micro rest. Many people, when they view the computer monitor, the blinking rate of their eyes goes down drastically, with little effort, this can be corrected. For a few days, consciously try to blink at the normal rate, if practiced for a week or two, you can regain your natural blinking rate when using computers, this can reduce eye strain to a good extent.